"You can absolutely be superhuman with just cameras." 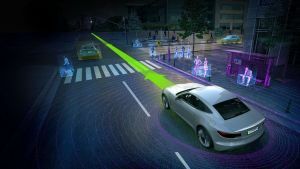 Elon Musk recently reiterated his stance that Light Detection and Ranging (LIDAR) technology is not a critical component of autonomous driving systems. On Wednesday, the Tesla CEO described it as a “crutch” during an earnings call on February 7, 2018. LIDAR calculates how far away a given object is by measuring how long it takes for a pulse of infrared laser light to reach a car and bounce back. Some of Tesla’s biggest rivals rely on it — Waymo is currently in a legal battle with Uber, asserting that the ride-hailing service stole its LIDAR designs — but Musk has been outspoken in his criticism. Instead of LIDAR, Tesla’s self-driving system is based on cameras. The cost of cameras continues to go down, even as pixel resolution improves. This could mean that Tesla’s automated vehicles would be more cost-effective, making the technology more accessible to a broader socioeconomic user base in years to come. Unfortunately, Tesla’s split with camera supplier Mobileye in 2016 threw something of a wrench into the works. After a fatal accident involving Tesla advanced driver assistance technology, or Autopilot, the supplier dissolved its partnership with Musk’s company. While Tesla has since developed its own replacement for Mobileye’s computer vision technology — aptly named Autopilot 2.0 — experts say it’s missing key pieces of functionality, like being able to read speed limit signs and recognize different kinds of vehicles. These features were included in the original Autopilot, which likely required Mobileye’s computer vision technology to operate. There have been doubts as to whether Musk will be able to upgrade Tesla vehicles that are currently on the road with enhanced self-driving capabilities. Thousands of owners have already paid for “Enhanced Autopilot” — which doesn’t quite exist yet — but competitors have called out Musk for overselling what Tesla’s hardware and software can accomplish. Musk is also quick to disparage his company’s rivals in the autonomous vehicle industry, but the Tesla CEO could soon find his company falling out of public favor if it can’t deliver on its promises.